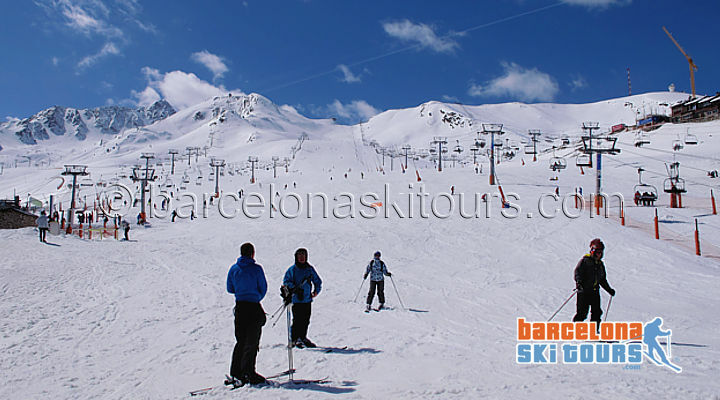 #S3 Tour: Ski day tour to Andorra Grandvalira ski resort. Please note. This tour is only suitable for skiers or snowboarders who are on intermediate or advanced level of skiing and who have their own ski wear. We do not offer tours to beginners and we do not rent ski clothes. 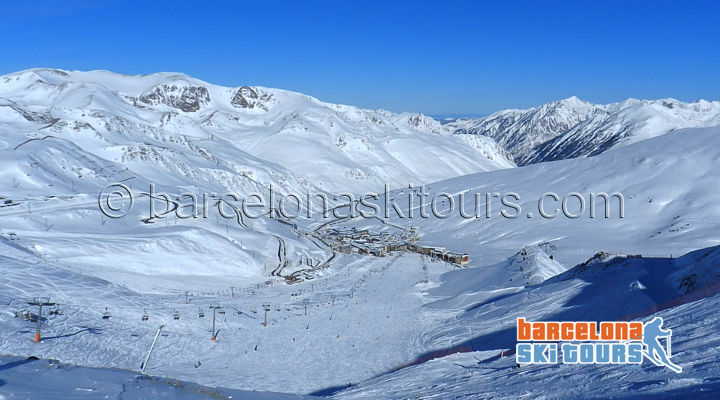 Duration of S2 Ski Day Tour: 13 hours total, which includes approx 6 hours alpine skiing at Grandvalira ski area. Your guide will help you rent skis and get your lift passes. If you like, your guide can ski with you and show you the slopes. 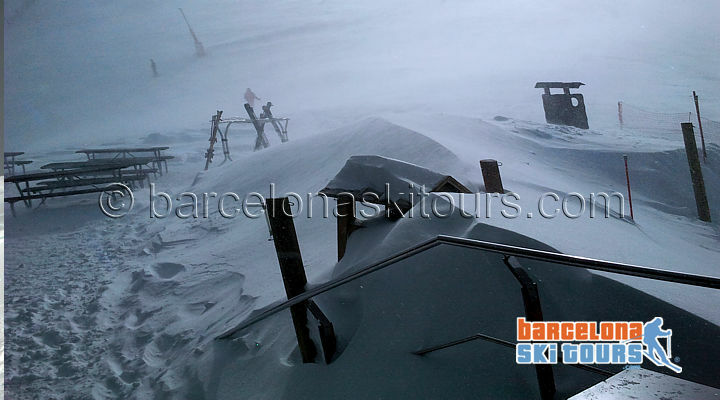 This ski tour operates from the middle of December until early April depending on snow conditions. The tour can be cancelled by operator at the last minute if weather/driving conditions are unsuitable. Deposits will be refunded in full. 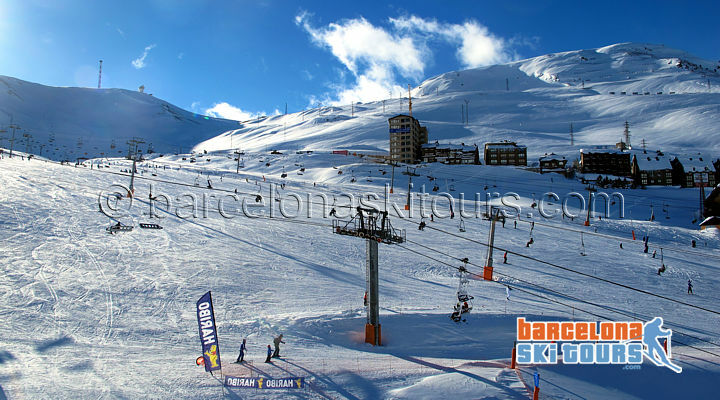 Enjoy a full day of skiing at the lovely mountain ski resort of Grandvalira. 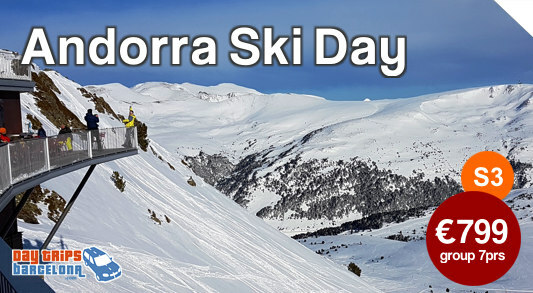 Grandvalira is the largest ski area in Andorra and also one of the largest ski areas in the Pyrenees with 205 kilometers of pistes and over 70 ski lifts servicing 112 ski slopes. 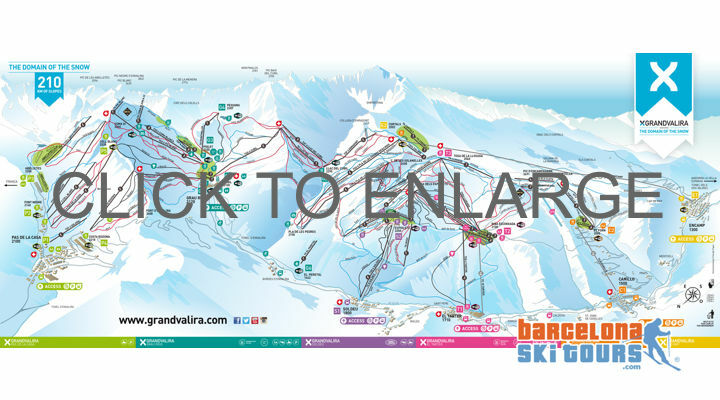 Grandvalira also has the longest ski trail in the Pyrenees of 9.6 km with a vertical drop of 850m from Tossa de Llosada in the El Tarter sector at an altitude of 2,560 m down to the village of El Tarter at 1,710 m.
The six ski areas in Andorra that are connected to form Grandvalira are called Pas de la Casa, Grau Roig, Soldeu, El Tarter, Canillo and Encamp. The lowest of the five villages is Encamp at 1300 m above sea level, and the highest village is Pas de la Casa at 2100m. 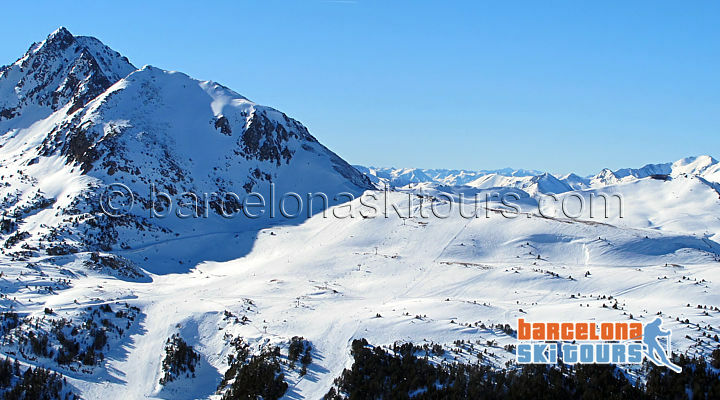 Most of the mountain peaks in the Grandvalira area reach an altitude of 2500m, so many runs are long and wide and have spectacular views of the surrounding mountains. Minivan seats maximum 7 persons. It is not possible to join a group - we only offer private ski tours at the above price. 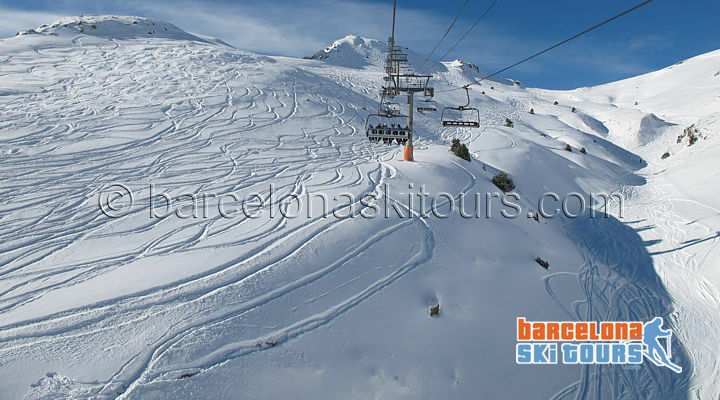 - The S3 Grandvalira Day Ski Tour is only available on Mondays to Fridays from start December to early April. No tours on Saturday or Sundays. 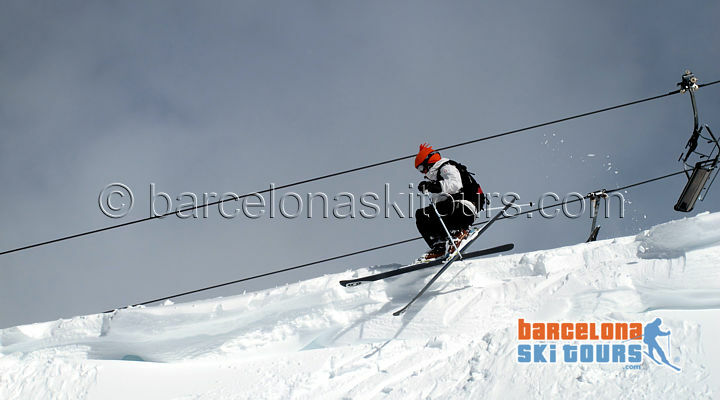 - Ski pass (approx €44), ski rental (approx €27) and meals are not included in tour price. Tour can be cancelled at last minute depending on snow or driving conditions. Please note: This tour is only suitable for skiers or snowboarders who area on intermediate or advanced level of skiing and who have their own ski wear. We do not offer tours to beginners and we do not rent ski wear. 1) Reservations are usually confirmed within 12 hours by email. 3) Children must be minimum 8 years of age for all standard tours. Contact us for private tours with children under 8 years. 4) Many of our tours have several hours of walking, so a normal level of fitness is required. Our tours are not suitable for people with bad hips or knees or other mobility impairments. It is the responsibility of the person booking to inform us of any special needs or health issues including walking difficulties or fitness issues. 7) Guests can bring their own meals or snacks but they cannot be consumed in the minivan.